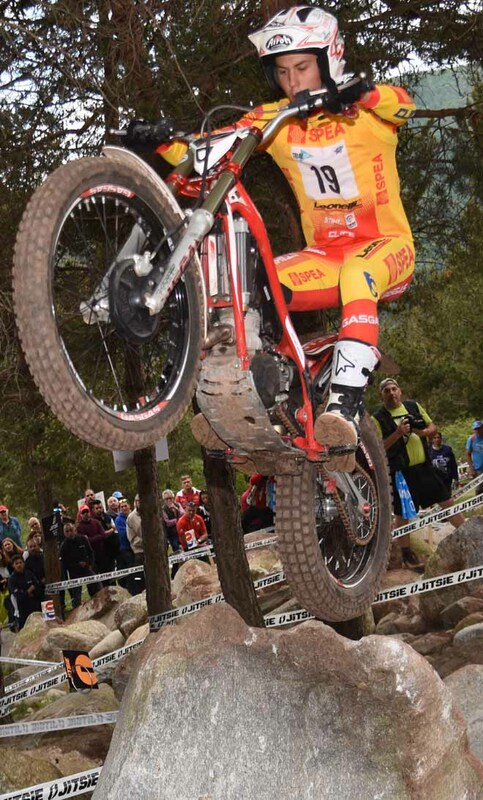 Jaime Busto - Repsol Honda topped qualification at the opening round of the 2017 FIM Trial World Championship and will start tomorrow's TrialGP Spain held in Camprodon at the back of the eighteen-man TrialGP field. The exciting new format was a big hit with spectators, riders and tens of thousands of online viewers as they watched the first live broadcast in the forty-three-year history of the championship on the Red Bull Motorsport Facebook page. 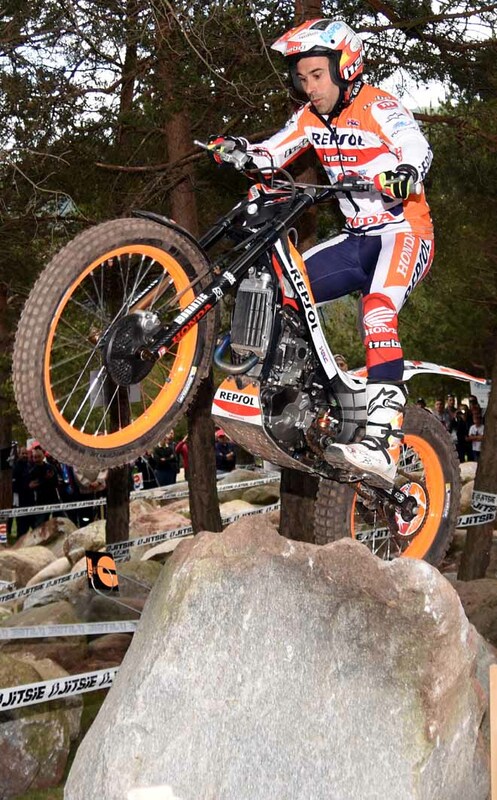 With the objective to stay clean in as quick a time as possible, Busto raced through the big, grippy rocks that formed the qualification section in a lightning-fast 0:29.47 to beat his team-mate and defending FIM Trial World Champion Toni Bou - Repsol Honda into second. Bou's time of 0:30.29 was six-tenths of a second faster than Adam Raga - TRS who was third. "I have missed the podium by one or two points on a number of occasions," says Busto, "but this year I'm confident that I can produce podium finishes and also improve in the championship." "This is my third year with Repsol Honda so I feel at home in the team, have much more experience and know the bike very well and how it responds in different conditions." 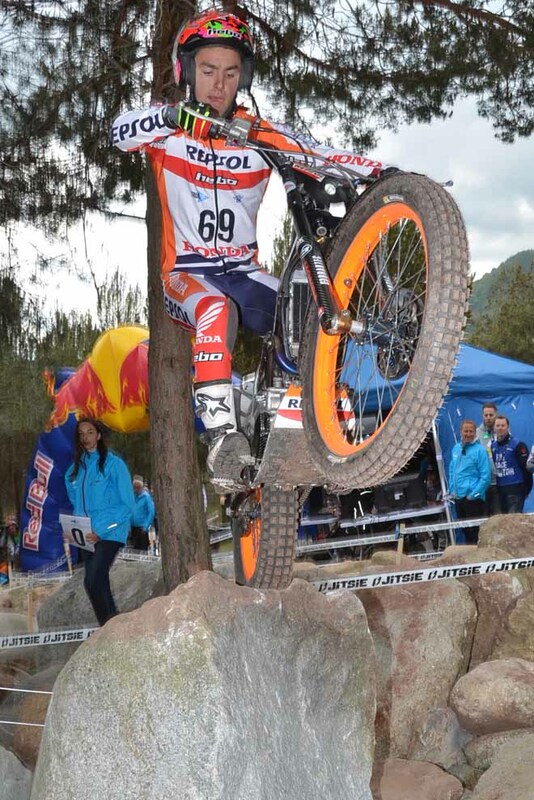 With all but five of the TrialGP riders going clean, the slightest mistake proved costly and a single dab from third-ranked Takahisa Fujinami - Repsol Honda means he will be fifth rider away tomorrow morning. The qualifying result was even worse for fourth-ranked Albert Cabestany - Sherco whose two-mark total means he will start second tomorrow behind Italy's Matteo Grattarola who recorded the only failure. 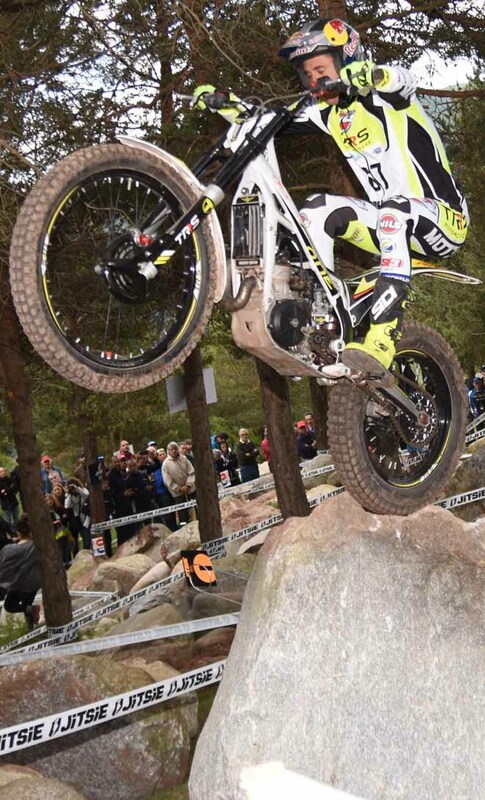 Riding an easier route, Norway's Hakon Pedersen - Gas Gas was a narrow winner in Trial2 from Italian Filippo Locca - Beta and home favourite Francesc Moret - Montesa. 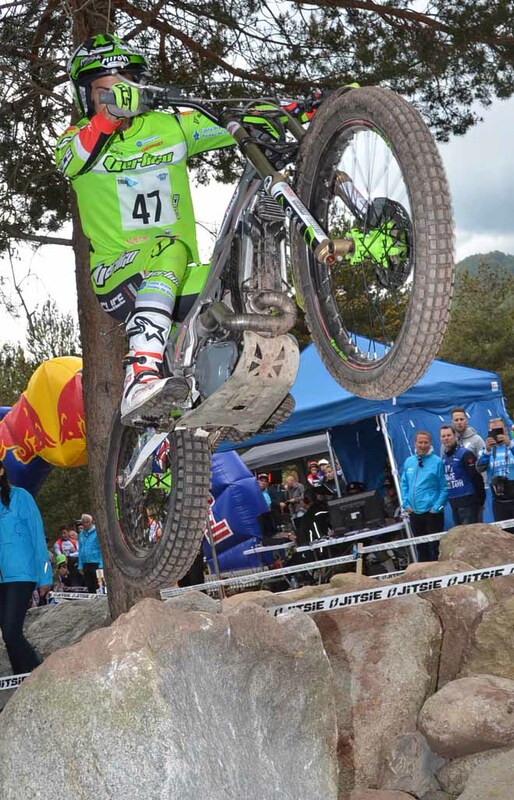 France's Fabien Poirot - Gas Gas was the fastest of eight riders to go clean in Trial125, finishing half-a-second clear of Danish rider Jarmo Robrahn - Gas Gas and almost three seconds ahead of third-placed Hugo Dufrese - Gas Gas from France. 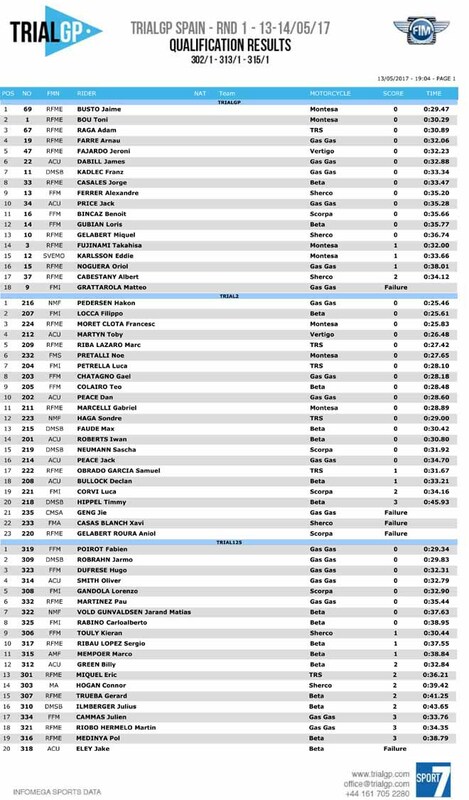 Full qualification results can be found at TrialGP-results.com along with the time schedule for tomorrow's main event. Come avviene in altri sport motociclisti, anche il Trial d'oggi ha una fase di qualifiche che serve a determinare l'ordine di partenza. Una zona relativamente facile in cui vengono conteggiati i punti ed il tempo come discriminante. Dei nostri, brutta partenza per Grattarola che cade alla prima curva che si affrontava a gran velocità. Unico a prendere il massimo dei punti, partirà per primo domani. Molto bene Locca, secondo nella Trial2. Buon inizio anche per Petrella, Gandola e Rabino. Non troppo bene Corvi, incappato in due errori.